Fast-tracking new Customs legislation, greater stakeholder engagement and speedier implementation of Government policy is imperative for Sri Lanka’s economy to adapt to an increasingly challenging environment, a top official said recently. 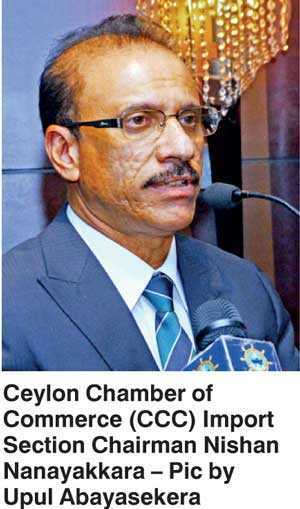 Ceylon Chamber of Commerce (CCC) Import Section Chairman Nishan Nanayakkara, speaking at the organisation’s 83rd Annual General Meeting (AGM) on Friday, recapped the difficult environment importers had to tackle in the past year and put forward policy suggestions on what could be done to mitigate some challenges. “The year under review was an extremely challenging one for importers. Escalating global prices, domestic tariff changes, currency depreciation, an increase in fuel prices and adverse weather conditions not only had negative implications on our economy but also hurt the competitiveness of our exports. Expenditure on imports increased by 9.4% to $ 20,980 million in 2017, recording the historically highest value for imports, mainly due to higher fuel ports,” he said. As per the Central Bank Annual Report, expenditure on non-fuel imports increased by 5.1% to $ 17,552 million. The increase in import expenditure was mainly driven by the increase in the imports of intermediate goods. Expenditure on the imports of intermediate goods, accounting for about 55% of total imports, amounting to $ 11,436 million in 2017, reflected a year on year increase of 15.9%. Nanayakkara also called for the Government to fast-track proposed new legislation, including a new Customs Act, as it would increase efficiency. The CCC Imports Section has also engaged the Government on trade agreements by serving in high-level trade consultative committees and making submissions based on the principle that such agreements should be anchored to the country’s national and strategic interest. Any agreements should only be forged after transparent board-based consultation with the private sector, Nanayakkara emphasised.